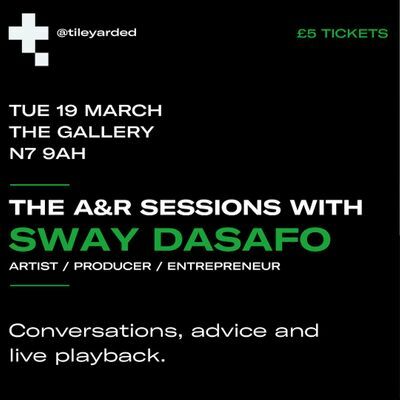 Join us in conversation with Sway Defaso for a night of A&R feedback at Tileyard Studios. The night will begin with an interview with Sway to find out more about his exciting career in music, followed by an A&R playback session with the chance to receive valuable feedback on your work. 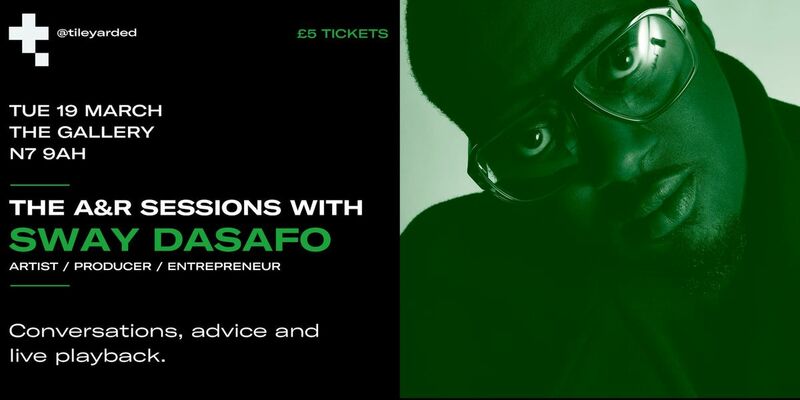 Sway (Dasafo)is a UK based Music Artist, Executive Producer and Entrepreneur. Sway was born and raised in North London, and after spending a short time in Ghana during early childhood he returned to England where he developed a fascination for English literature. He became the first unsigned rapper to win a MOBO Award prior to the release of an official album. And decided he would prefer to release his first album ‘This Is My Demo’ independently, giving his demo directly to the people rather than the record companies. Tracks such as ‘Flo Fashion’, ‘Up Your Speed’ and the Al Shux (Jay Z, Kendrick Lemar, Nas) produced UK top 40 ‘Little Derek’ became genre-defining moments of this era. In 2006 ‘This Is My Demo’, became one of the most critically acclaimed UK Rap albums of all time, and Sway then went on to be the first British rapper to win an American BET Hip Hop Award as well as landing a spot on the Mercury Music Prize Shortlist. Amongst Sway’s supporters are international superstars, Akon, Lupe Fiasco and Pharrell Williams who had all displayed an interest in signing the UK rapper to their own label imprints. After months of consideration, Sway decided he would become part of Akon’s international Konvict Music family alongside the likes of Lady Gaga and T-Pain. Sway was also the only other rapper to be featured on Lupe Fiasco's US Billboard number 1 album ‘Lasers’ released in 2011. Sway's next single ‘Level Up’ written with Flux Pavilion (Kanye West, Jay Z, Example) became Sway's highest charting single to date landing at number 8 in the Official UK National charts. Sway now turns his attention to building a label and curating talent. Through his search he came across south London rapper/singer Tiggs Da Author, who he took under his wing and signed to his revived Dcypha Productions label as well as signing YouTube star KSI. In the same year Sway released a long awaited third album entitled ‘Deliverance’, which he describes as “an affirmation of my intentions”. The album was released with no lead singles or videos, as Sway wanted it to serve its true purpose as “a project to be discovered”. As a writer and producer Sway amassed over a billion music streams world wide across platforms such as Youtube, Spotify, Apple Music and he continues to work with emerging talent as well as accomplished creatives to push musical boundaries forward. New Reign Productions, houses a stable of music producers, graphic designers, directors, song writers and other creative minds. As a group they are set to release an array of singles in the near future. Whilst working on a new album entitled ‘Next Chapter’ Sway decided to revert back to releasing under his full original artist name ‘Sway Dasafo’. Now armed with an arsenal of new music Sway walks into 2019 with a plethora of collaborative projects (Brillionaires, 5ive 9ine) and new music ventures to look forward to. Sway’s ‘Next Chapter’ album will be accompanied with a book and short film and is his self-proclaimed his best music to date. This is sure to sell out! Grab your tickets quick! More on Sway here.